The process of estate planning can often become very complex for citizens of all income levels and estate sizes. 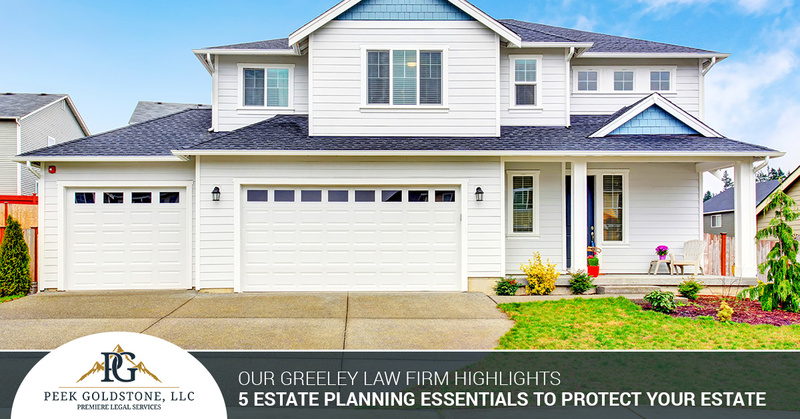 Many Coloradans understand the importance of drafting a will and creating a trust for beneficiaries, but few understand the importance of other essential elements included in an estate plan. This process serves to keep your assets safe and secured, providing stability and comfort for loved ones once you are gone. As your trusted law firm in Greeley and Erie for a variety of services, Peek Goldstone, LLC is here to deliver comprehensive legal assistance every step of the way. Our estate planning attorneys focus on providing a complete approach to your assets and goals by minimizing any complications in order to create a seamless transition once you pass on. While it might feel morbid to discuss your passing, it is vital for Coloradans to enact their own plans in case the unexpected happens. Today, we’ll cover five essential pieces needed to create a comprehensive estate plan. When you’re ready, be sure to reach out to our estate lawyers for assistance! Adults with children need to take extra steps to ensure that their kids are protected and looked after in the event a guardian needs to be appointed. Designating who will care for your children until they reach adulthood is one of the most important aspects of a will or trust, and a choice that should be made with care. Many current and expecting parents reach out to loved ones that share similar views on religion, finances, child-rearing, and more, to ensure that their children are cared for as seamlessly as possible. It is also important to discuss this decision with your potential guardians to ensure they are up to the task. Without designating a guardian, the court may need to step in and make a decision on your behalf. A durable power of attorney (POA) empowers an agent or individual to act as your representative in the event you are unable to do so. A power of attorney gives your appointed agent the ability to make major decisions on your behalf, including financial actions, real estate management, private affairs, and more. As the principal, you will have the ability to change or revoke your decision if you are competent enough to do so. In most cases, it is a good idea for your spouse to receive power of attorney in case you are incapacitated. In case you are incapacitated and unable to make clear decisions under your own power, it is helpful to have an advance directive that appoints your healthcare power of attorney (HCPA). This decision can be difficult, as you will be tasked with finding a close family member or loved one who shares your outlook on major healthcare choices. Directives can be given based on resuscitation preferences, feeding tube plans, and more. Nobody wants to think about the prospect of being unable to make their own medical decisions, yet appointing an HCPA will help to ensure that you are cared for properly. Similar to your designated guardians, we recommend providing a backup choice in case your loved one is not able to perform the necessary duties. While a number of assets can be passed on through the directives listed in your will, certain possessions can pass on automatically. Upon your passing, a number of plans (401(k)s, life insurance, etc.) will be paid automatically while other assets remain in place until they pass through probate. It is essential to designate your primary and secondary beneficiaries to ensure that your items are given to your loved ones in the manner you prefer. Appointing a beneficiary can be a major decision, but Peek Goldstone, LLC is here to help. Our estate planning attorneys are experienced in creating legal trusts and wills for families of all types. Call us today to learn more about our estate lawyers’ approach to your retirement! Finally, any plans or directives not covered above will need to be addressed in your will and trusts. The strategy deployed when estate planning will depend on your estate and possible responsibilities; some clients are best off relying on a will while others may want to develop a trust to minimize legal issues. Trusts are an important tool for families across Colorado, as trusts help to avoid the probate process. Trusts can also take effect while you are alive, something a will cannot accomplish. In many cases, both documents are used to ensure that all bases are covered. If you are considering a trust, be sure to reach out to our local law firm for assistance in ensuring every element is consistent. Peek Goldstone, LLC is here to serve as your trusted estate planning attorneys in Greeley, Erie, and across Weld County. Our experienced team has the skills to represent clients on a variety of cases, ranging from DUI charges to family law, criminal defense, and more. Contact us today to schedule your appointment — we look forward to helping you!